August 08, 2009 by Alphageek in "alphageek bourgon homestead falconing canoe hot springs 1766"
Things have been rather slow here on Alphageek's Thoughts lately. With all the activity of life, writing has taken a back seat to other activities. I intend to try to catch up this weekend with a mega post weekend! That's right, I have saved up a multitude of original thoughts that I am going to share with you, even if you don't care. Mrs. Alphageek called months ago and said the words I love to hear: we are going to Homestead for her business! This is an exciting time because Mrs. Alphageek has to work and I get to goof off. In this instance, it is probably best to just rattle off the different things we did, rather than try to tell some intricate story. Don't like my approach? I am still waiting to see your writing. The Homestead has been around a really long time. They have a restaurant called 1766, which is supposedly the year they were founded. That is a really long time ago. If age is any indication, it is a great place. It is a classic mountain resort that everyone should go to, at least once. Unfortunately, cell phones work there, so you will have to tell the office something when they try to call and you decide to let the call roll to voice mail. 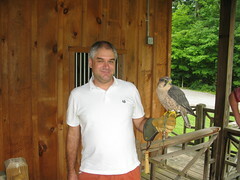 Mrs. Alphageek got the vacation off to a great start by telling me I could go falconing! I have always wanted to watch these large birds in action. We spent about an hour discussing the history of the sport, as well as a photo opportunity that you can see here. This bird was extremely photogenic and loved to pose. She makes an excellent contrast to me. Next time, I will photoshop in someone else! We then switched gears and each person got to hold some food while the bird swooped in from a tree to grab the food. These birds are fascinating because they are not nearly as domesticated as a cat or dog. The trainer said if you don't take care of the birds, they just fly away. We spent the rest of the time watching the other members of our party take their turns feeding the birds. It was a very quick two hours that just flew by. Hey, I made a funny! We had a dinner at the 1766 Restaurant. This is the kind of place that someone cooks the food right at the table for you. Believe me, for what they are charging, they had better go the extra mile. We enjoyed a fine, relaxing meal and were amazed at the excellence of restaurant. We also went canoing. I don't think Mrs. Alphageek had a very good time. We were taken to a secret location, where I was put in back of the canoe. Mrs. Alphageek did not like the way I steered the canoe. Just because I banged into the bank once, she got really mad. The kind of mad that you laugh at when you see another couple because you are glad its not you arguing. However, things worked out well in the end and we had an exciting canoe trip. I still don't think she will let me drive the canoe ever again. We had another fine meal at Sam Snead's Tavern. I highly recommend everything on the menu. I also have a small travel tip: this place serves Homestead Lager. You should check out this beer because it certainly trumps the usual Bud selection the rest of the restaurants have. We also spent some time just wandering around. This place is huge, with lots of little hidden goodies. We found a hot spring outside that you can dip your feet into. However, this outside spring pales in comparison to the indoor pool that is heated entirely by a hot spring. The pool certainly beats going to the Jefferson Baths up the road and taking off all of your clothes in front of strangers. I guess a word about Jefferson is in order too. Everything is named after him here. It is part of revisionist Wahoo history to attribute everything that ever happened to Mr. Jefferson. Don't fall for it. At any rate, we found the pool to be refreshing, but I did not feel that it was very therapeutic. So, you are now saying “this is great, but what about bourbon?” That is where the Homestead really excels. You can sit on around on the “Grand Porch”, which is the main entrance to The Homestead, and order drinks during the evening. The weather was outstanding while we were there, making for a very pleasant bourbon experience. When I ordered my bourbon with only two ice cubes, that is what I got and my hassle factor was non-existent. The almost perfect bourbon sipping place. For a collection of pictures, simply click here and enjoy. "alphageek bourgon homestead falconing canoe hot springs 1766"